Manage your bottom line – don’t let it manage you. The 4.5-day Certificate in Finance & Accounting program will demystify your route to financial success and help you develop a well-rounded understanding of language and requirements of financial expectations and performance. Learn the finance language to better communicate with finance professionals in your organization. Led by our faculty experts and their proven methods of instruction that include class exercises utilizing Excel, case analysis and instructor lectures, you will better understand financial reports, utilize the information they contain, and contribute to financial decisions. The Certificate in Finance & Accounting certificate is targeted to those who are new to financial concepts and techniques, as well as any professional who wishes to update his or her knowledge of basic finance and accounting. It is particularly applicable to individuals whose backgrounds are in functional areas such as marketing, sales, manufacturing, HR, and engineering. The Certificate in Finance & Accounting is awarded to individuals who complete the week-long program. Accounting - Dr. Karen K. Nelson, Professor of Accounting. The accounting portion focuses on accounting and builds the foundation for participants to understand the significance and use of information in financial reports relative to management decisions. The learning objectives include identifying the relationships between the primary financial statements, the significance of accrual accounting concepts and the differences between income, cash flow, assets and expenses and the meaning of the terms and data found in financial reports. Finance - Dr. George Kanatas, Professor of Finance. The finance portion deals with managing growth, earnings and cash, and with a firm's weighted average cost of capital and its relation to both Economic Value Added (EVA) and capital expenditure analysis. The learning objectives include gaining an understanding of the effect of growth on earnings and cash and how to determine optimal growth, the study of how to determine a firm's cost of capital and how it relates to the distinction between earnings and economic profit. Financial Statement Analysis - Dr. Brian Rountree, Assistant Professor of Accounting. The financial statement analysis portion concentrates the knowledge garnered from the first two sessions in understanding how companies' strategies and operational execution are revealed in financial statements. We develop a systematic performance evaluation methodology that provides the foundation for assessing current and future economic prospects, along with linking this information to valuation. 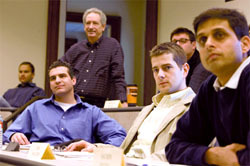 The learning objectives include developing an understanding of earnings management techniques and evaluating the implications for future performance, introducing the concept of ratio analysis and illustrate how to adjust ratios for differences in accounting techniques and operational decisions, creating a systematic method for evaluating firm performance using publicly available financial statements and linking this to forecasts of future performance.